You are here: Home » MEDIA » Music/Audio » Thunderbirds Are Go Volume 1: Original Television Soundtrack music by Ben Foster & Nick Foster (CD review). 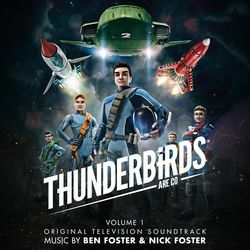 Thunderbirds Are Go Volume 1: Original Television Soundtrack music by Ben Foster & Nick Foster (CD review). When I first came across this CD of ‘Thunderbirds Are Go’, I did have to wonder why wasn’t the entire first season on a single CD. Looking at the contents and then reading the 28 page booklet, Silva Records didn’t hold back. You’re essentially getting the full music tracks from the first thirteen episodes, with the pilot, ‘Ring Of Fire’, split into two although that doesn’t make much difference at music level. Purely as orchestration, the brothers Ben and Nick Foster have made some music here that would have worked regardless of the series its applied to. Even with familiarity with the 2015 series, you don’t actually need to have seen it to enjoy this music. It’s like listening to mini-symphonies than musical beats. Occasionally, you will come across references to the original Barry Grey 1966 orchestration like in ‘Fireflash’. The booklet does point out extended pieces but that’s more like being measured in seconds than anything too lengthy. I’ve referenced the booklet a couple times already but think I should go into a little more depth because apart from musical notes, there is actually a decent wealth of photos from these episodes with full pages of TB1, TB5 and, at a pinch because its above the island, TB3. The rest of the photos are smaller but recognisable. As such, this makes this CD very much a collectable item and you’ll have to buy two because you can bet your sprogs will play it to death. Although the Fosters aren’t Barry Grey, I mean who can really compete with him, this is actually a very fine piece of music and moves from one track to the next in a seamless fashion that I could happily see played at the Proms one day. I should point out that Volume 2 is going to be released on 7th November 2016. « Deadpool Original Soundtrack by Junkie XL and various artists (CD review).